The OMEGA PX271A pressure transducer is ideal for use in pneumatic control systems and other industrial applications. The sensing element is a 100% solid state piezoresistive silicon chip featuring low hysteresis, excellent repeatability, and long term stability. The signal conditioning and temperature compensation are performed by industrial quality integrated circuits to provide an accurate, linear, user selectable 0-5 or 0-10 Vdc signal. Pneumatic transducer with 0-20, 0-10 and 0-5 psig selectable ranges and 0-5 or 0-10 Vdc selectable output. Pneumatic transducer with 0-30, 0-15 and 0-7.5 psig selectable ranges and 0-5 or 0-10 Vdc selectable output. 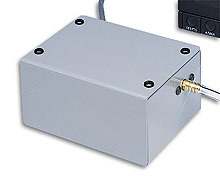 Pneumatic transducer with 3-15 psig range and 0-5 or 0-10 Vdc selectable output.